Here we are presented with a doubling or doppelganger again, in the form of the monolithic object around which our action circles. Holly has drunkenly pursued the (living?) figure of Harry Lime through the streets of Vienna, only to have him disappear somewhere in the vicinity of this mysterious object. Today’s frame presents an identical monolith, this time in the sober company of Major Calloway. While the framing, blocking and general lighting make these two scenes nearly identical, the lighting on the monolith itself changes its inherent character, making our two monoliths slightly dissimilar while identical. While every aspect of the two monoliths is nominally the same, the flat, even lighting on today’s frame reveals it as simply an object, while last week’s shadowy object seemed to hide its secrets around every corner. The two, nominally identical objects have become, again, doppelgangers, but one of a more nefarious nature than the other. Another of Vienna’s native sons, not Freud this time, but instead Lang, knew the terrors of doppelgangers. In his unbelievably high-budget 1927 film, Metropolis, Lang presented two nearly identical characters with strikingly different characters. Maria begins the film by organizing the workers in the city’s underclass, while the automaton designed to replace her sows seeds of strife in that same proletarian group. Like our twin monoliths, the robot double hides secrets that Maria would lay bare. But this doubling extends beyond the object that occupies our frame’s center, since the frame itself, indeed the moment it occupies, is doubled too. For Holly, wandering into this square again, he can but wonder at the sense of deja vu that must greet him. Clouded even more by the drunken shock that accompanied him on his last visit to this square, Holly must be wondering to himself whether he has indeed been here before, or if instead he is arriving here again for the first time. To put it more succinctly, Holly must be wondering if he has somehow moved to a plane different from the one he occupied only 62 screen seconds ago. Like the characters in The Matrix (1999), Holly must wonder if he could have somehow slipped into a world in which the rules are slightly different. One can even set up quite ridiculous cases. A cat is penned up in a steel chamber, along with the following device (which must be secured against direct interference by the cat): in a Geiger counter, there is a tiny bit of radioactive substance, so small that perhaps in the course of the hour, one of the atoms decays, but also, with equal probability, perhaps none; if it happens, the counter tube discharges, and through a relay releases a hammer that shatters a small flask of hydrocyanic acid. If one has left this entire system to itself for an hour, one would say that the cat still lives if meanwhile no atom has decayed. The psi-function of the entire system would express this by having in it the living and dead cat (pardon the expression) mixed or smeared out in equal parts. It is typical of these cases that an indeterminacy originally restricted to the atomic domain becomes transformed into macroscopic indeterminacy, which can then be resolved by direct observation. That prevents us from so naively accepting as valid a “blurred model” for representing reality. In itself, it would not embody anything unclear or contradictory. There is a difference between a shaky or out-of-focus photograph and a snapshot of clouds and fog banks (Schrödinger, Die gegenwärtige Situation in der Quantenmechanik, November 1935). This thought experiment can be understood in many ways for our film, but there is one understanding that may not be scientifically viable but seems too tempting to avoid. Harry Lime has already in this film been represented by a cat, one who Anna stares at longingly while remembering her late lover, “Harry’s cat,” and his very vivacity is at question as we speak. 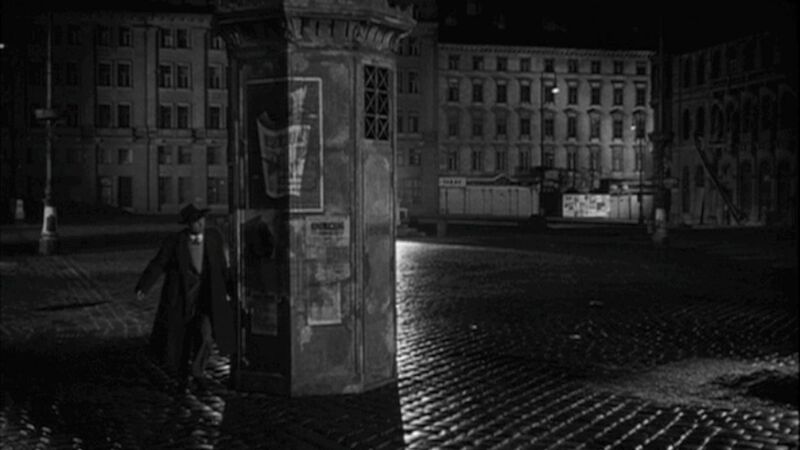 This man, who has been nominally dead throughout the entire film, has recently appeared to Holly in a drunken furlough through a Vienna alleyway. This pushes the limits of double vision, seeing a man both alive and dead at the same time, but Holly chases this ghost through the streets to where our very frame leaves us today. To a box. Like Schrödinger’s famous cat, our tomcat seems to have retreated inside this box, and by opening it we may or may not find him to be dead. 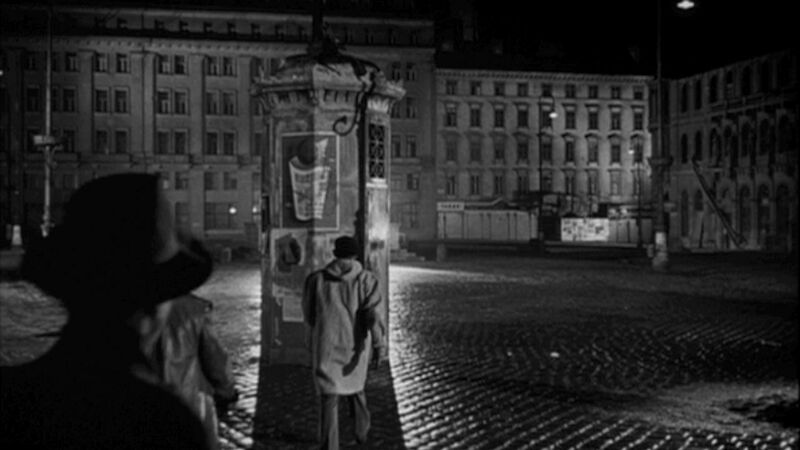 At this moment, Harry, like the cat, is both alive and dead at the same time, necessitating these two possible universes, these two monoliths breaking the horizontal lines of this Vienna square. “People stared at her in silence as she removed her shoes and coat. From the open window of the black Toyota Celica parked next to the turnout, Michael Jackson’s high-pitched voice provided her with background music. “Billie Jean” was playing. She felt as if she were performing a striptease. So what? Let them look all they want. They must be bored waiting for the traffic jam to end. Sorry, though, folks, this is all I’ll be taking off today. Aomame slung the bag across her chest to keep it from falling. Some distance away she could see the brand-new black Toyota Crown Royal Saloon in which she had been riding, its windshield reflecting the blinding glare of the afternoon sun. She could not make out the face of the driver, but she knew he must be watching. Don’t let appearances fool you. There’s always only one reality. Aomame took in a long, deep breath, and slowly let it out. Then, to the tune of “Billie Jean” she swung her leg over the metal barrier. Her miniskirt rode up to her hips. Who gives a damn? Let them look all they want. Seeing what’s under my skirt doesn’t let them really see me as a person. Besides, her legs were the part of her body of which Aomame was most proud. Stepping down once she was on the other side of the barrier, Aomame straightened her skirt, brushed the dust from her hands, put her coat back on, slung her bag across her chest again, and pushed her sunglasses more snugly against her face. The emergency stairway lay before her–a metal stairway painted gray. Plain, practical, functional. Not made for use by miniskirted women wearing only stockings on their otherwise bare feet. Nor had Junko Shimada designed Aomame’s suit for use on the emergency escape stairs of Tokyo Metropolitan Expressway Number 3. Another huge truck roared down the outbound side of the expressway, shaking the stairs. The breeze whistled through the gaps in the stairway’s metal framework. But in any case, there it was, before her: the stairway. All that was left for her to do was climb down to the street. Aomame turned for one last look at the double line of cars packed on the expressway, scanning them from left to right, then right to left, like a speaker on a podium looking for questions from the audience now that she had finished her talk. There had been no movement at all. Trapped on the expressway with nothing else to occupy them, people were watching her every move, wondering what this woman on the far side of the barrier would do next. Aomame lightly pulled in her chin, bit her lower lip, and took stock of her audience through the dark green lenses of her sunglasses. You couldn’t begin to imagine who I am, where I’m going, or what I’m about to do, Aomame said to her audience without moving her lips. All of you are trapped here. You can’t go anywhere, forward or back. But I’m not like you. I have work to do. I have a mission to accomplish. And so, with your permission, I shall move ahead. Aomame had the urge at the en to treat her assembled throng to one of her special scowls, but she managed to stop herself. There was no time for such things now. Once she let herself frown it took both time and effort to regain her original expression. Aomame turned her back on her silent audience and, with careful steps, began to descend the emergency stairway, feeling the chill of the crude metal rungs against the soles of her feet. Also chilling was the early April breeze, which swept her hair back now and then, revealing her misshapen left ear” (Murakami, 1Q84, Knopf, 2011, pg. 11-12).